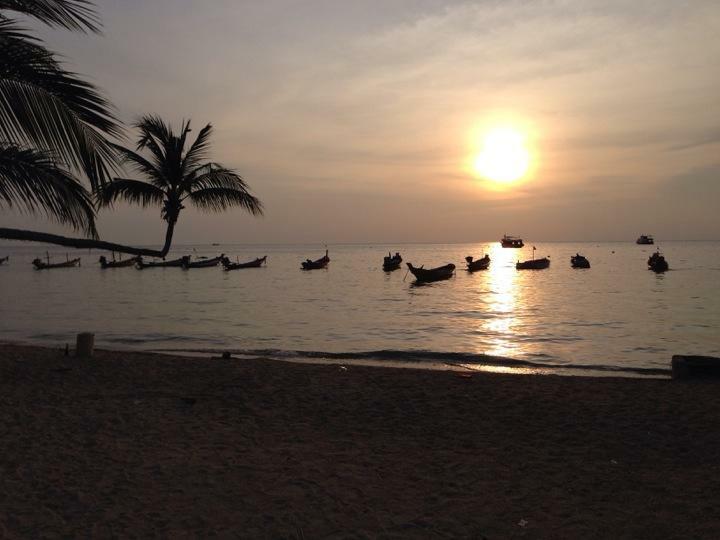 Day 14, 15, 16: Staying on Sariee Beach in Koh Tao at Sariee Cottage to get my Open Water Scuba cert. I start my morning off with a run through the city then meet Justin for breakfast before our course starts at 9am. The course is 3.5 days long and involves classroom work, homework, confined water lesson (in the pool) and 4 open water dives. The first time strapping on all my scuba gear is surprising. I'm a pretty strong gal but this crap is heavy! I'm wonder if there are some people that are not strong enough to walk in their gear. We start with learning how to breath underwater in a saltwater pool with our scuba gear on (I keep wanting to type "scooba" instead of "scuba" because I have probably written Scooby more in my life than scuba!). The first few minutes is very strange. My instructor signals underwater to breath deep, fully exhale, and not hold my breath. Once I started to fully exhale and take deep breathes, it became more natural and comfortable. The next day is our first open water dive. Tonight I went to Crossfit Koh Tao. I have been feeling homesick for the past few days and I realize after my warm up that I find comfort and a sense of belonging and home here at crossfit. Its a relief and it feels good to be getting back on track. The heat and humidity makes it very difficult. Texas is both hot and humid, but this is a whole different beast. Oh, and there is no A/C at this box. Day 15: We have two open water dives today with an hour between each one. The first dive is only 8 meters deep and last about 50 minutes. While underwater our instructor puts us through various skills lessons including flooding and clearing our masks, pretending to run out of air, losing our regulator (the breathing apparatus), and other various lessons. There is about 14meters of visibility during these two dives and its amazing the aquatic we see. I think of my mom and how much she would enjoy this. I start to get cold even though these are some of the warmest waters you would ever dive in (28 degrees C). If you know me, you know I am NOT happy when I'm cold. So about 30 minutes into our dive I wish we were going up, but we aren't for another 20 minutes. We warm up and eat fruit for about an hour then dive again, a bit deeper to 10 meters this time. Again, there are amazing sights but I am cold and also a bit too ADD. After about 20 minutes under, I lose interest and want to go up, but I stay with the group. After the first 2 dives I understand how much having your own equipment with a quality mask that fits your face and doesn't fog, a wetsuit that fits properly and is the right thickness to keep you warm and flippers that dont rub your feet can probably make the experience MUCH better. After a full day in the sun and in the water, I'm too tired for crossfit. Day 16: Our final two dives are this morning. Our first dive goes down to 17.5 meters and the second to 15mThe max you can go with the type of certification we are getting is 18 meters. The visibility today is far less than yesterday, only 4 meters, so the dives today, while deeper, are less enjoyable. We return to shore around noon as certified open water divers with the ability to dive anywhere in the world down to 18 meters. This island is full of dive masters that came here years ago and never left. Story after story of individuals being hooked after their first dive and wanting more and more. I will definitely dive again, but I don't plan to buy my own equipment and fully immerse myself in diving. I think my attention span is too short to fall this deeply in love with diving. Or maybe I just haven't been to as good of dive sites as others, so I will be curious to see how I feel about diving in the future as I try different dive sites. I end the evening with another workout at crossfit koh tao. This time, my dive instructor is there as well. We had talked at some point during the course and when I mentioned I am going he said that he has a membership as well. Joanna Wish I could be there!